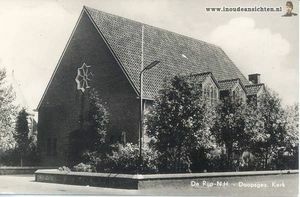 Doopsgezinde Kerk, De Rijp, 1960. Source: De Rijp In oude ansichten. De Rijp, a village in the Dutch province of North Holland (1947 population, 1490, with 86 Mennonites). In the 16th century, before reclamation of the lakes, it was situated on an island, and so offered good protection to the persecuted Mennonites. There were Anabaptists here at a very early date; Arent Jacobs of this town was drowned with his wife and son at Monnikendam about 1539 because they had been rebaptized. A congregation soon formed, and by the end of the 16th century the village was practically all Mennonite. The De Rijp congregation belonged to the Waterlander branch, although in the 17th century a more conservative tendency was noticeable here than was usual among the Waterlanders; for this reason it joined the Zonist Sociëteit in 1664. In the 16th century it was the most outstanding Waterlander congregation in the Netherlands. In 1576 Hans de Ries was baptized here. De Rijp was one of the first congregations to join (1601) the union of the High German and Young Frisian Mennonites (see Bevredigde Broederschap). The congregation had excellent preachers, such as Jacob Jansz Scheedemaker from 1557, the principal author of the Waterlander confession of faith of 1577; Pieter Pieters de Oude 1600-25; Jan Willemsz 1610-died 1660, who was also a physician, and Engel Arentsz van Dooregeest 1666-died 1706. In the 17th and early 18th centuries some of the Mennonites of De Rijp took active part in the Collegiant movement, often attending the meetings at the Collegiant center at Rijnsburg, which was severely censured by the rather conservative leaders of the congregation. The relations with the Reformed Church and the magistrates of De Rijp were better than in most Dutch towns. As early as 1574 a Mennonite preacher is reported to have preached in the Reformed Church; in the 17th century Mennonites occupied magisterial offices and were often very influential. In the 18th century this prosperous congregation suffered a rapid decline, principally for economic reasons. The herring and whale fishing industries and their subsidiary industries such as shipbuilding, in which many Mennonites were engaged, grew less and less important. A large number of the De Rijp Mennonites moved to Amsterdam. The membership, which was still 472 in 1670, decreased from that time on. There were 403 members in 1704, 167 about 1800, some 200 in 1809, 160 in 1847, 184 in 1900, and 68 in 1958. The first meetinghouse burned down in 1654; the replacement was considerably renovated in 1853. The present church was dedicated on 13 December 1953. The congregation once possessed an orphans’ home, mentioned first in 1676. The institution was completely rebuilt in 1866; but since 1912 there have been no orphans. In the 17th and 18th centuries the congregation had great wealth; most of the property has been lost since then. One of the outstanding lay members of this congregation was Jan Adriaensz Leeghwater (1575-1650), the noted mill builder and “engineer,” to whom North Holland owes the initiative for the reclamation of the many lakes, and partly also the execution of this task. A complete list of preachers and deacons from 1557 to the present has been preserved. The first minister of De Rijp who was trained at the Mennonite Seminary at Amsterdam was Anthony de Vries, 1770-71; he was followed by two lay preachers, Johannes van Grouw 1771-79 and Pieter Hartman 1780-1815. Since that time all the ministers have been educated at the Amsterdam Seminary: Pieter Hollenberg 1805-15, Jan Persijn 1816-60, Jan de Verwer 1855-71, S. Kutsch Loyenga 1872-73, W. J. van Douwen 1874-87, W. I. Leendertz 1888-90, J. S. Pekema 1891-94, P. Sijbolts 1894-1901, J. P. Smidts 1902-8, G. Fopma 1908-13, J. Scherpenhuysen 1914-23, P. Keuning 1925-52, and L. Koopmans 1954-57. The pulpit is now vacant. Since July 1949 the pastor of the De Rijp congregation also serves the Graftdijk and Noordeind van Graft congregation. Church activities include a ladies’ circle and a Sunday school for children (in co-operation with the Reformed Church). De Rijp has been the seat of the Rijper Sociëteit since the middle of the 17th century. A well-known Dutch hymnal was the Rijper Liedt Boecxken. Cate, Steven Blaupot ten. Geschiedenis der Doopsgezinden in Groningen, Overijssel en Oost-Friesland, 2 vols. Leeuwarden: W. Eekhoff en J. B. Wolters, 1842: v. I, 270. Den Rijper Zeepostil. Amsterdam, 1699: 269-372. Doopsgezinde Bijdragen (1863): 110; (1872): 57; (1876): 36 f.; (1877): 79; (1900): 89, 109: (1909): 169-72. Fopma, G. "Uit de Geschiedenis der Doopgezinde Gemeente in de Rijp." Doopsgezinde Bijdragen (1917): 9-65; (1918): 1-42. Hege, Christian and Christian Neff. Mennonitisches Lexikon, 4 vols. Frankfurt & Weierhof: Hege; Karlsruhe: Schneider, 1913-1967: v. III, 512 f.
Hoop Scheffer, Jacob Gijsbert de. Inventaris der Archiefstukken berustende bij de Vereenigde Doopsgezinde Gemeente to Amsterdam, 2 vols. Amsterdam: Uitgegeven en ten geschenke aangeboden door den Kerkeraad dier Gemeente, 1883-1884: v. I, Nos. 708, 892, 896; v. II; No. 2927; v. II, 2, 462-64. Nieuwe Rotterdamse Courant (28 April 1956). Persijn, J. Een viertal geschriften betr. de Doopsgezinde Gemeente in de Rijp. Norden, 1857. Zijpp, Nanne van der. "De Rijp (Noord-Holland, Netherlands)." Global Anabaptist Mennonite Encyclopedia Online. 1959. Web. 22 Apr 2019. http://gameo.org/index.php?title=De_Rijp_(Noord-Holland,_Netherlands)&oldid=145801. Zijpp, Nanne van der. (1959). De Rijp (Noord-Holland, Netherlands). Global Anabaptist Mennonite Encyclopedia Online. Retrieved 22 April 2019, from http://gameo.org/index.php?title=De_Rijp_(Noord-Holland,_Netherlands)&oldid=145801. Adapted by permission of Herald Press, Harrisonburg, Virginia, from Mennonite Encyclopedia, Vol. 4, pp. 333-334. All rights reserved.